Art is all about starting again. – David Bayles and Ted Orland, in Art & Fear. I don’t believe in starting over, but I do believe in starting again. Back in January, when I was taking a drawing class, I sketched almost every day. Towards the end of class, my discipline slid, mainly because I was traveling and busy. Since the class ended, however, I am drawing very little, a sketch a week if I’m lucky. I’d like to get back to drawing more regularly. I guess it’s time to start again. 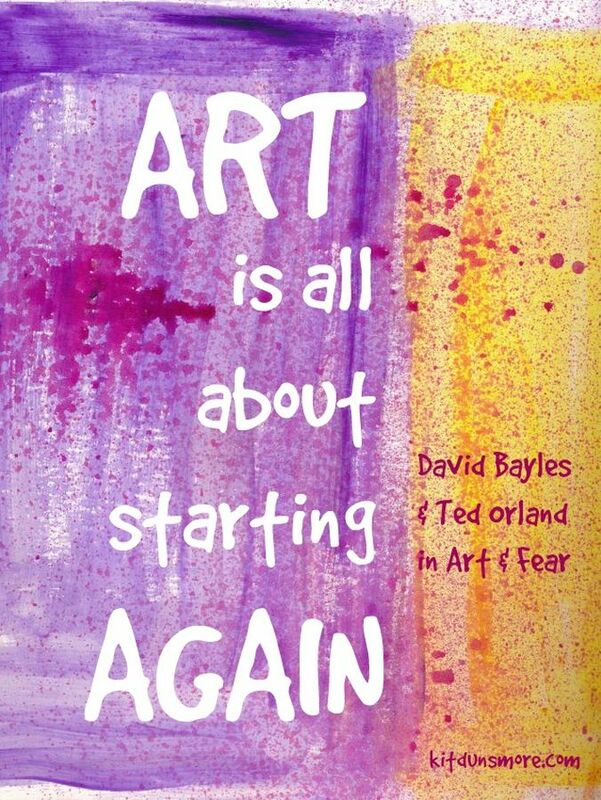 Recognizing that art requires us to start again and again and again is helpful. It explains to me why it is so hard. Every drawing I make requires me to start again. There’s the anxiety of the unknown — not knowing what to do, how it will turn out, or if I will be pleased with the results. Most of my drawings aren’t successes, but I have to remind myself of that as well. I’m still learning how to do what I want to do. I’m practicing. I’m building my skills and finding what I like and what works for me. I have to be willing to make mistakes in order to get where I want to go. And so I must start again. Every day feels like a new start, with all the good and the bad that implies. Fortunately, if I don’t pick up my pen today, tomorrow I can start yet again. That is so true! But each time you start you carry over some of what you learnt and thought from the previous drawing. That’s why I like to draw on a regular basis — it is easier to remember what I have learnt from before! Happy drawing. I find it’s true with all creative work. Stay away too long, and you forget things you’ve already learned. It’s really obvious when I haven’t used my sewing machine in a while, but I can also lose the flow of words that makes it easy to write if I let myself stop for too many days in a row. My drawing feels very hit or miss, so when I sit down to draw, I have to be prepared to stink. Happy sketching! Just like you have to expect muscles to shriek a bit when you get back to exercising! You are so right. I have to motivate myself to write/knit/draw by convincing myself that I have to get through my “quota” of not-so-great stuff before I can start making the things I can be proud of. Sometimes I’ll use that excuse to scribble some silly drawing in my sketchpad or knit another quickie hat, like I’m making hashmarks against my experience so I can more quickly get to the good stuff. I think we have to make lots of hashmarks in order to learn what we want to make. And the hashmark work builds skills so you can branch out and get original later. Lots of my knitting is “rote” and feels like practice rather than something inspired. But now and then I branch out and alter a pattern. I also participate in NaNoWriMo every November in order to blast out a lot of words and stir up my idea pot. Some of it is junk, but some of it is ore that can be refined into gold. I find the hashmark work rewarding because at least I get to spend time in process, actually doing the thing I love (knitting, writing, drawing, sewing) and I believe it leads to the bigger stuff eventually. I wouldn’t keep up with all this work if I wasn’t already enjoying it, but like you, I hope it results in some noteworthy work.